Wise Vibes. : Uncooked report on raw milk. Uncooked report on raw milk. Last week's blog sparked a lively conversation on my Facebook page about fast food in particular and mass produced food in general — it stemmed from my mention of a McDonald's sundae in my last blog. Therefore, I thought this would be a good time to service the "balance the body" aspect of the blog. This week I am sharing with you a report I did on the fight over raw milk between "real food" enthusiasts and the FDA and CDC. Once you have read the report, I would be very interested in knowing where you, as a consumer, stand in your choice of milk - raw or pasteurized? This was a project for one of my journalism classes so you will not be able to guess my opinion on the matter but I will let you know how I feel once I hear from you :). I got an "A-" on the report as well as in the class so I can assure you that it would be worth reading :). Let me know your thoughts! 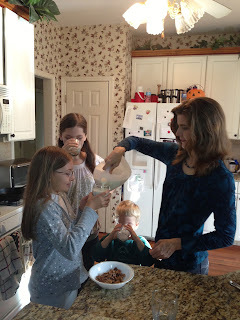 Skousen at home with her children, pouring them raw milk. BUFORD, GA — Celeste Skousen feeds her children something that the state of Georgia says is illegal for human consumption: "Raw cow's milk for pets." She pays $7 to $10 per gallon to buy this raw milk from a local farm outside Atlanta — almost three times the price of a regular gallon at the supermarket. But she says it’s worth the price because she believes raw milk is superior, in nutrition and taste to pasteurized milk. "It's the difference between a living food rich in nutrients and health-promoting properties, and a lifeless [pasteurized] fluid with dubious nutritional value," said Skousen, mother of four and a volunteer chapter leader for the Weston A. Price Foundation, a nutrition education organization. Skousen represents three percent of the American population that circumvents the law to consume raw milk because they believe that pasteurization kills milk's beneficial properties. They want the U.S. Food and Drug Administration (FDA) to lift the ban in 20 states, including Georgia, where its sale is illegal for human consumption and it is labeled as pet food. Recently, this fight has also become about who has the right to control what Americans eat; the people themselves or government agencies. Raw milk proponents say that they should be the decision makers of what they consume, without government restriction. The FDA says that the ban was put in place to protect public health. Raw milk can cause serious to fatal diseases like diphtheria, typhoid fever and tuberculosis; the ban prevents such illnesses as well as protects children who rely on their caretakers to make food choices for them. Dr. Barbara Mahon, Deputy Chief of Enteric Diseases Epidemiology Branch at the Centers for Disease Control (CDC) said pathogens originating from raw milk, like E. coli O157, spread quickly, especially in the young and the elderly. She said that parents who give raw milk to their children not only put them at risk but may also give them an infection that can spread to their playmates. "When it comes to communicable diseases, people’s right to choose their own actions must be balanced by other people’s right to not be exposed unnecessarily to a serious illness," said Dr. Mahon. Advocates of raw milk say that infection outbreaks from raw milk are rare. The website www.realmilk.com posted a report "Those Pathogens, What You Should Know" by Dr. Theodore Beals, an anatomic pathologist and an advocate of raw milk, presented by him at the International Raw Milk Symposium in July 2011. The report found 42 illnesses per year from raw milk consumption, amongst its nine million consumers. The report analyzed CDCs data and stated that there are 48 million cases of food borne illnesses annually in America, all attributable to fruits, vegetables and meats, except for the 42 that were traced back to raw milk. "A lot of rhetoric is spent pounding the table about germs, illnesses, hospitalizations and the like, but when we look at the statistics with a clear mind, there are many other causative factors involved in food-borne illnesses that have nothing to do with raw milk," said Skousen. Milk pasteurization started in the U.S. around 1886 and became the law and standard of safety in 1987. However, with the advent of "back to nature" practices, people started questioning processed foods, including milk. Raw milk has been gathering more fans in spite of the regulations against it, while the demand for pasteurized milk is declining. Raw milk proponents attribute its increasing popularity to people's growing awareness about nutrition and their interest in local and sustainable foods, supporting local agriculture and getting produce from sources that they can visit and examine for themselves. "I never have the opportunity to see what goes on inside of factories — at the local farm, I inspect the cows, pasture, milking room, and equipment any time I want," said 31-year- old Sandra Walker, a mother of two boys and a teacher of traditional food preparation. Joseph Frank, professor of Microbiology at the University of Georgia, thinks the attitude of Walker and other raw milk advocates is due to nutrition "mis-information". "Americans like to believe in government and corporate conspiracies and are distrustful of authority," he said. He added that the average consumer, without a background in science and nutritional issues may not understand the complex food chain and can be lead to make wrong choices. 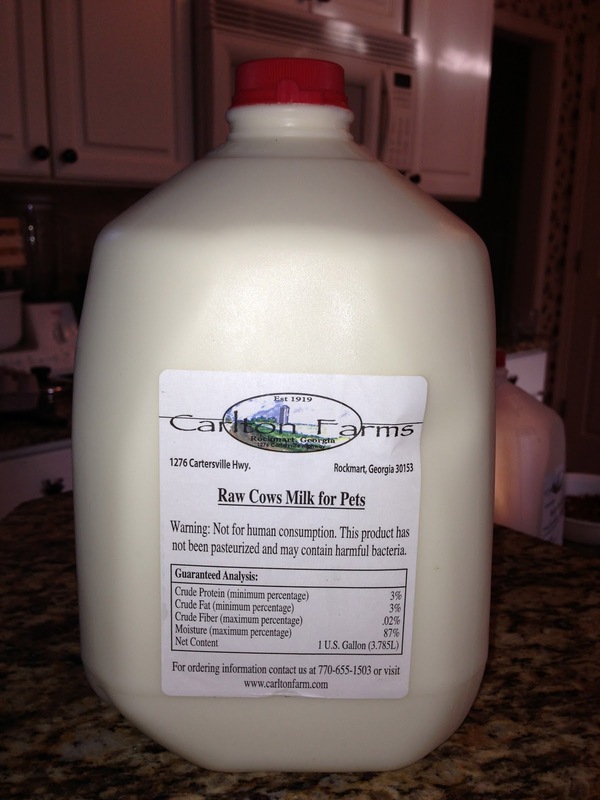 Raw milk is sold as pet food in states where its sale is illegal for human consumption. It has a warning label stating it may contain harmful bacteria. However, professor Frank believes that people should have the right to choose as long as they take "100 percent" responsibility for costs resulting from their actions, "In this way, their risky behavior would not increase the health care costs of those engaging in less risky behaviors," he said. Dr. Alex Kojo Anderson, a nutritionist, professor of Nutrition, Epidemiology and Biostatistics at University of Georgia, agrees that people should have a right to choose but the government has a responsibility towards public health too — he wants proper labeling of foods so that consumers can read and make a decision for themselves. "Nobody wants the government in their business but when a problem arises they want the government to solve it — we won't call the farmer to solve the problem of an infection outbreak, will we?" said Dr. Anderson. 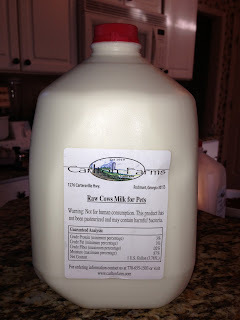 Raw milk proponents say that the risks associated with raw milk are inflated. They believe in the "terrain theory" — for them it is not the raw milk itself that is a health hazard but it is a question of the lifestyle of the cows and the bottling and storing of the milk. "Cows allowed to live out on pasture eating a diet primarily of grass rarely show pathogens in their milk at all," said Skousen. The FDA website states there are several venues for contamination. "[Raw] milk could be contaminated by environmental factors such as soil or animal feces, animal diseases, or bacteria on an animal's skin," wrote John Sheehan, Director of Division of Plant and Dairy Food Safety, in FDA's March 2011 article titled "Raw Milk May Pose Health Risks". The FDA website further states, "Research shows no meaningful difference in the nutritional values of pasteurized and unpasteurized milk," and also rejects raw milks' proponents belief that it has beneficial effects on people with lactose intolerance, asthma and allergies. Dr. Mahon says that most in the scientific community feel that the high risks associated with raw milk outweigh any possible benefits. A CDC study reported that 1500 people got sick between 1993 and 2006, from raw milk and its products. The CDC website has videos of former raw milk consumers telling stories of its adverse effects. Advocates of raw milk say the government manipulates data to make raw milk appear dangerous and instill fear in people. They believe that in order to continue to get financial support from large corporations and commercial dairies, the government is marginalizing small farmers who produce raw milk. "Large corporations have a lot of money and therefore greater influence over what data gets presented. Small farmers and private citizens don't have much of a say," said Walker. Raw milk producers are afraid of losing their livelihood; one of them asked for anonymity for this article to avoid possible repercussions. "Things get traced back and I know of horror stories of farmers like myself getting shut down or arrested by the government," said a local farmer, who labels the milk according to the law. Proponents want freedom of choice and an end to the ban on raw milk. "It is a troubling world when I can buy industrial hamburgers made from pink slime dunked in ammonia, but it is illegal for me to buy milk from a farm," said Skousen.